The culture ministry, and an affiliated government agency, said Friday they have unveiled a fashion collaboration between Korean designer brands and popular girl group Red Velvet at a showroom in New York City. 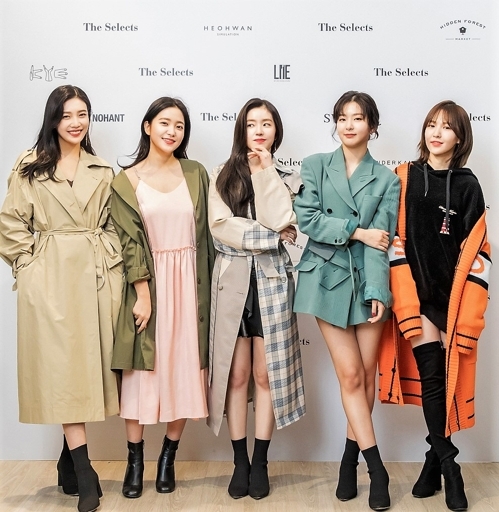 “The Selects X Red Velvet,” unveiled on Feb. 21 (U.S. time), is the first collaboration from The Selects, a Korean fashion showroom run by the Ministry of Culture, Sports and Tourism and the Korea Creative Content Agency (KOCCA) in Manhattan. The collection consists of various casual fashion items created by five Korean designer brands in collaboration with five members of the group — Yeri, Seulgi, Irene, Wendy and Joy. The five brands are Hidden Forest Market, Nohant, Lie, SWBD, Wnderkammer. “We unveiled samples of the designs this time, and if they are received well among local buyers (in New York) it will become possible to put them on sale at home,” a KOCCA official said. The Red Velvet members visited the showroom on the sidelines of their tour of five U.S. cities to celebrate the launch of the collection. The Seoul government offices opened the showroom during the New York Fashion Week in September last year to help Korean designer brands make inroads into the global market.